Replace Teeth Easily with Full and Partial Dentures! Missing teeth is far from only a cosmetic oral issue. In fact, there are many implications for your overall health as well if you don’t replace missing teeth, not just oral problems. Luckily, Dr. Wanda Davidson is not only capable of helping you keep teeth clean and healthy. She’s also completed an additional three years of post-graduate specialty education in prosthodontics. With this training, she’s fully qualified to provide custom-made full and partial dentures for patients with extensive tooth loss. To get started rebuilding your new smile with Dr. Davidson, contact her office today to schedule an appointment! How Can Missing Teeth Affect Your Oral and Overall Health? It’s common for people to feel more self-conscious about smiling when they’re missing teeth, but did you know there are actually oral and systemic consequences that start to show if you don’t consider prosthetics? 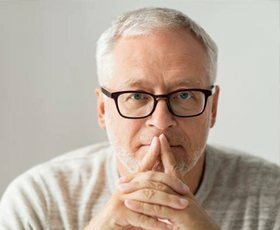 One of the most common side effects of tooth loss is a misaligned bite, which starts happening the moment teeth are extracted. The body naturally reacts to missing teeth by allowing existing teeth to shift into the open space in order to compensate. This quickly results in an uneven bite, increasing the risk of teeth grinding and enamel erosion, which is permanent. Furthermore, missing teeth make it far more difficult to enjoy the foods you love, especially if those foods are tough, chewy or otherwise require a lot of biting force to consume. As a result, many people are unable to keep a balanced diet, which in the worse-case scenario can lead to malnutrition. That’s where full and partial dentures come in. These dental prosthetics are designed to take up space in the mouth, make eating certain foods much easier, and give back the smile you’re used to! Full dentures are intended to replace the entire arch, while partial dentures work to replace consecutive teeth on either side of the mouth. 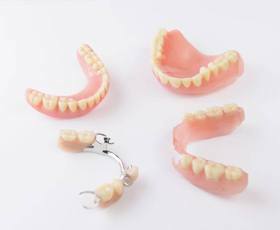 Full dentures typically use an acrylic base and porcelain teeth, while partials usually rely on metal hooking systems. 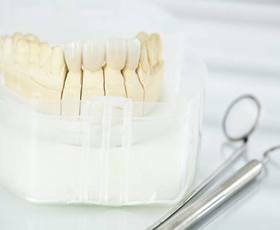 What Does the Procedure for Dentures Entail? To make your denture, Dr. Davidson will take an impression of your mouth and use that information to measure its exact dimensions. Then, she’ll send that model to a dental lab where a trusted technician will begin putting together your prosthetic, including the base and the porcelain teeth. After cleaning, they’ll send it back to the office where you can have it fitted. If adjustments are needed, Dr. Davidson will make sure they’re addressed so your denture is as comfortable as possible. If you’re tired of settling for soft foods and hiding your smile on a daily basis, contact our office to learn more about the process and benefits that full and partial dentures can offer!